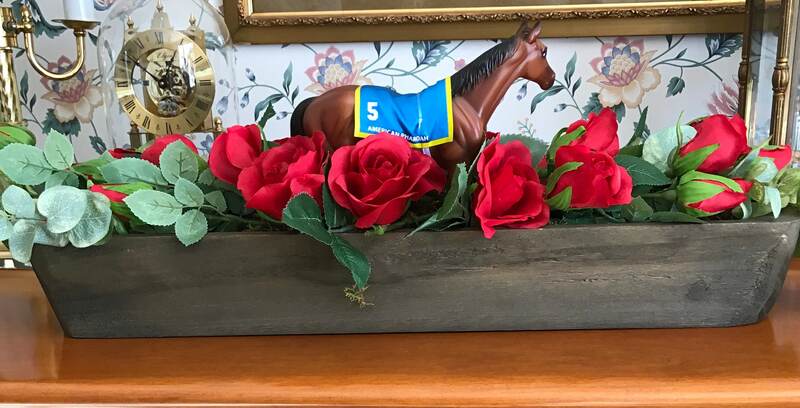 Equestrian Horse Centerpiece Horse Race Red Rose Flowers "Run for the Roses"
The racing season is almost upon us. 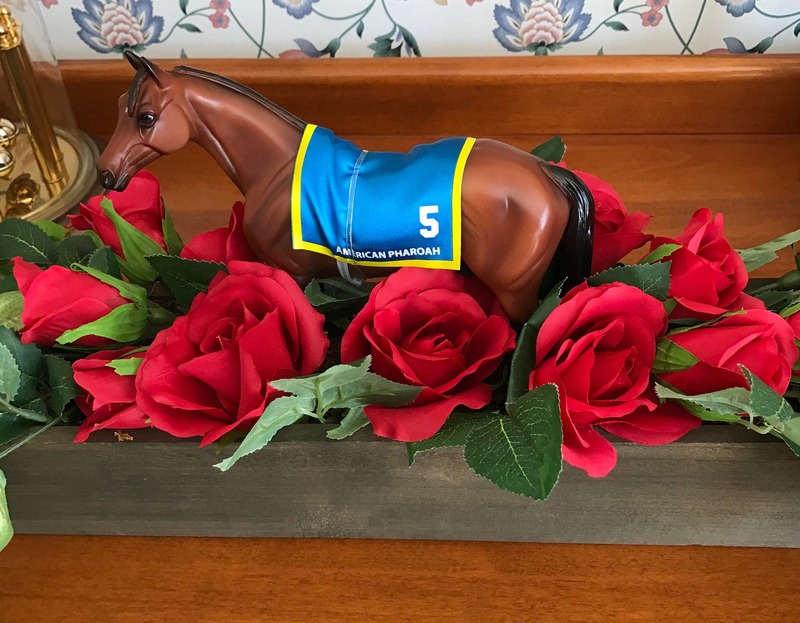 “ Run for the Roses” is my new equestrian signature home piece for 2019. This amazing piece is 24” + in length. The container is made with barn wood. 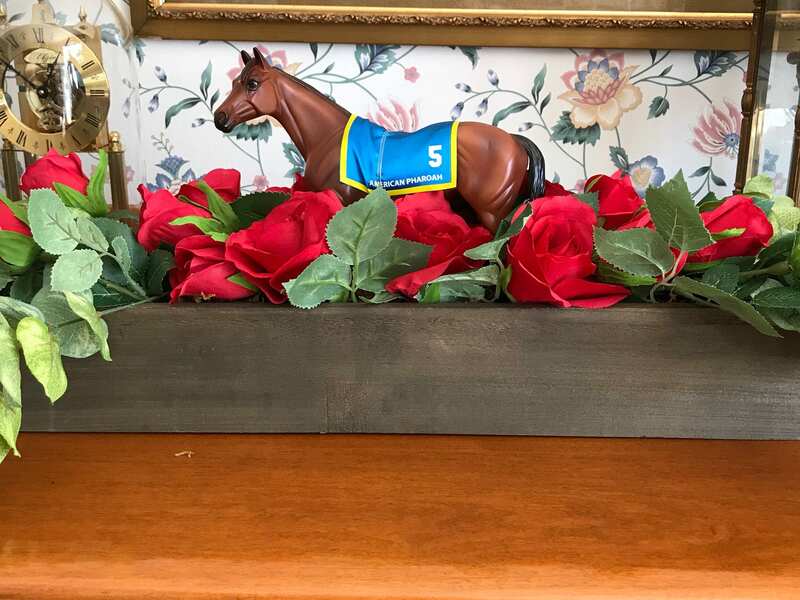 In the center is the Breyer model horse “American Pharaoh “ an amazing Triple Crown winner, surrounded by a bed of silk red roses. The flowers used are top quality silks giving the centerpiece its fresh look. This floral is perfect for a dinner table, buffet table, arena lounge or entryway. This is definitely a statement piece and sure to complete your equestrian decor. Designed with the Kentucky Derby in mind, it is appropriate for any event. Add a few pine branches, take off the saddle pad and it is all set to do double duty and be a Christmas centerpiece as well. I am also custom making this arrangement in different colors and flowers and breed of horse for weddings, horse shows, parties and home table. Please keep an eye out for more pictures to come. I can design this with your wedding colors, home decor colors or barn colors. Message me and we can design exactly what you want. The great part about this piece is once your event is over, the arrangement stays.